While EUR is being supported by the positive GDP in Eurozone and Factory Orders in Germany, it is also under the influence of the recent changes in Italy. 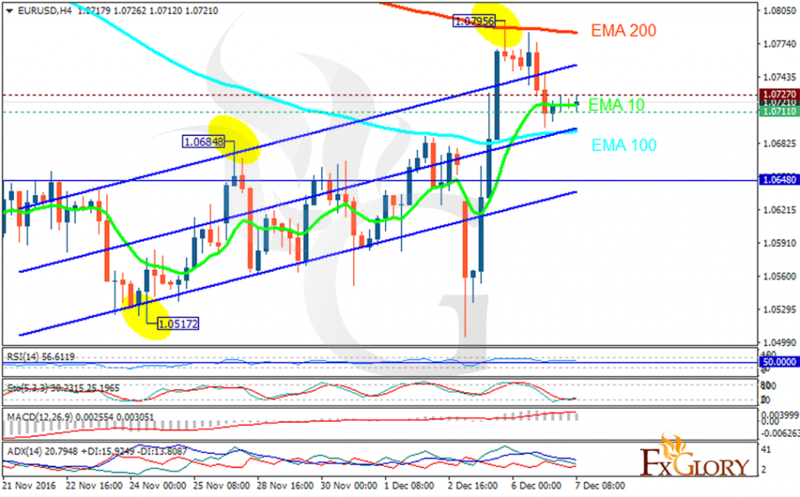 The support rests at 1.07110 with resistance at 1.07270 which both lines are above the weekly pivot point at 1.06480. The EMA of 10 is moving horizontally and it has crossed the EMA of 100 but it is below the EMA of 200. The RSI is moving above the 50 level, the Stochastic is moving in low ranges and the MACD indicator is in positive territory. The ADX is showing a weak buy signal. The chart seems bearish for now targeting 1.0700.